Education is key to job security, community growth and individual wellness. However, not all individuals can travel to or live in the large cities where universities are located. Establishing the Koinadugu College will empower youth, inspire innovation, and provide opportunity for all community members. Kabala is packed with youth who are passionate, bursting with initiative, resourcefulness and brilliance. In the same breath, we recognize its sheer underdog position: Sierra Leone is a country wounded from civil war and the Ebola outbreak. With a population of 400,000+, Kabala is considered one of the poorest regions in the country. No matter how capable or brilliant a young person is, they need opportunities to fuel it. 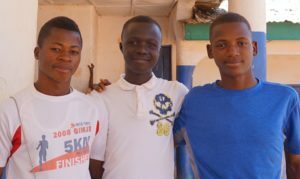 Meet the high-potential youth of Kabala, Sierra Leone. We met Mariama at the Science and Leadership Festival in Kabala, Sierra Leone in January 2017. Mariama is an engaging, driven, intelligent young leader who has taken advantage of every educational opportunity available in Kabala. At the Science and Leadership Festival, she was chosen to lead a session on teaching others about the telescope. Most kids and adults attending the festival had never seen a telescope before. Neither had Mariama. She took the instructions for the telescope home with her to study up on how a telescope works the night before her session. In preparation for the festival the next morning, we saw a box with all of the pieces for a telescope in it without instructions on how to assemble it. Despite language barriers, a group of local Sierra Leoneans worked with one of our volunteers from the U.S. to slowly assemble the telescope without instructions. 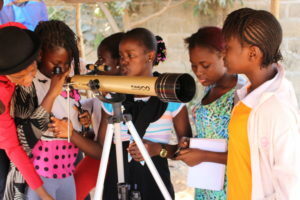 Soon after the group assembled the telescope, Mariama showed up with the instructions, ready to lead her session. Mariama led session after session that day teaching people about the telescope. Most got the opportunity to look through a telescope for the first time. Mariama’s talent and desire to succeed was evident. Unfortunately, there are no nearby opportunities for her to elevate her skills to the next level. There has never been an opportunity for higher learning in the Koinadugu District of Sierra Leone. Stories like Mariama’s inspire us to launch Koinadugu College. 17-year-old Aconte used to start his school days at midnight, walking miles to fetch water for his family’s daily needs, followed by a long journey on foot to school – reading books along the way and through the night. Instead of complaining, he voiced the need for a hand-dug well in his community. 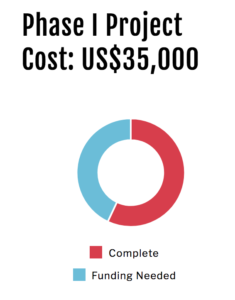 He worked with international partner Strides for Africa to obtain the necessary funds, resources and support to make it happen. At the age of 17, Aconte now helps to maintain the community’s well. Aconte is another example of a youth who would take advantage of Koinadugu College if it were available in his community. We are using red clay bricks, obtained from local soils for our building needs. The use of locally derived clay soil bricks have reduced our use of the high-energy consuming mortar cement by 90 percent. We are also using local contractors and labor for all of our work, which creates a source of employment. The wood or boards used for roofing were obtained locally from the community. We have used zinc roofing that are cheap, affordable, corrosion resistant, self healing and have low maintenance regime. We have additional plans to use solar panels to power the Main Academic Building.